Teams will fly BACK to British Columbia and Vancouver. Once in Vancouver, they must find their next clue in Terry Fox Plaza at BC Place. Gino & Jesse arrive at the cluebox first (after telling their taxi driver NOT to take any other teams) and find the Road Block: Who wants to roll with it? 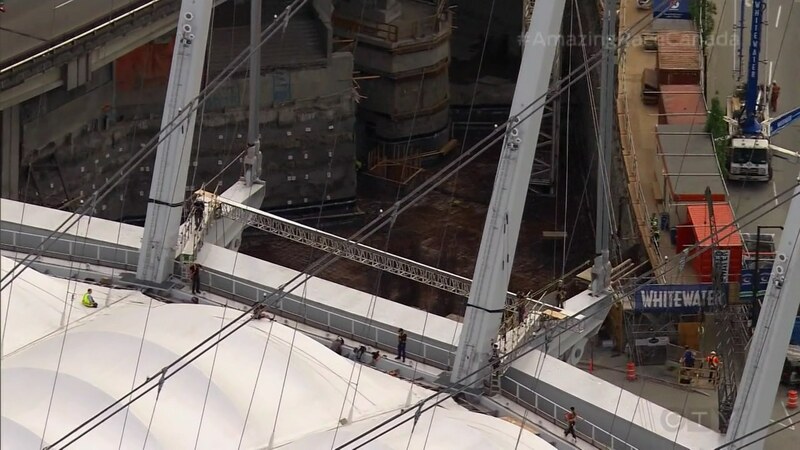 For this Road Block, teams will cycle across a narrow plank suspended by the arena’s roof beams. If they fall, they must go to the back of the line. Gino, Matt and Brent do the Road Block. Gino and Matt easily get through the Road Block and teams must now make their way to the Olympic Plaza in Whistler. 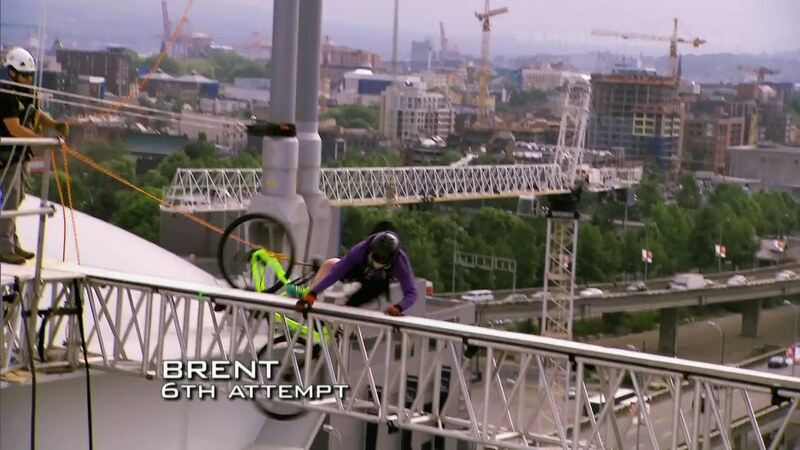 But Brent struggles. After his 7th attempt, Sean decides to go up and encourage his brother. Brent finally finish after 20 attempts. Over in Whistler, teams will make their way to Squamish Lil’wat Cultural Centre where they will find map boards. Teams must calculate the total distance traveled this Race by using a string and a scale on the map. After adding together the distance on each Leg in miles, they must convert to kilometers and be within 5% of 48,500 kms to receive their next clue. Nick & Matt arrive at the maps and finish before Gino & Jesse. Teams must now make their way to Barefoot Bistro. Teams will head into the wine cellar and each team member must saber off the cork of two champagne bottles; one using a traditional saber and the other using the base of a champagne flute. Gino & Jesse are right behind them, but don’t erase all their calculations. That allows Brent & Sean to just copy it and go. 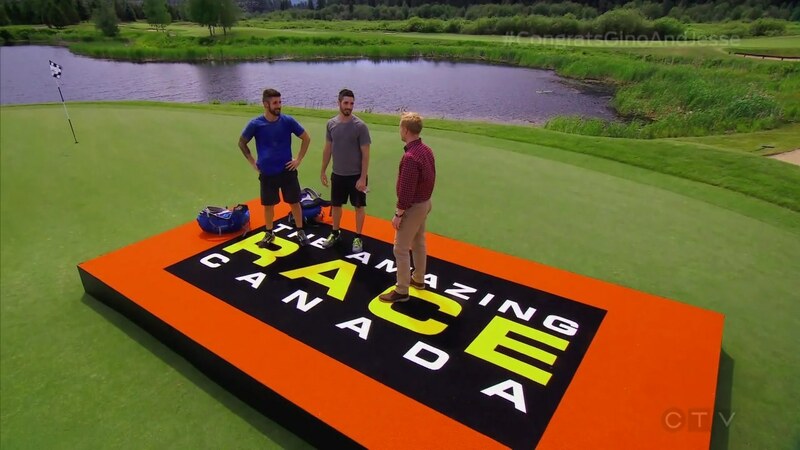 Nick & Matt maintain their lead and teams must now take the Whistler Village Gondola to their clue at the top of the mountain. They head outside and try to take Gino & Jesse’s cab, but the driver says no Gino & Jesse run out. Gino & Jesse arrive at the cluebox on the mountain and find another Road Block: Who’s ready to meet one’s match? For this Road Block, teams must match a provided ski with its only pair amongst a thousand others. 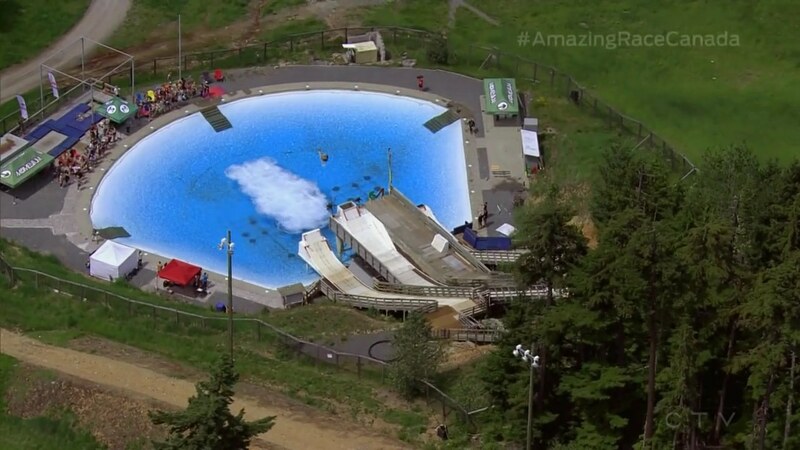 Jesse finds the matching pair and they must now take the Peak2Peak gondola to the Momentum Ski Camp on Blackcomb Mountain where they must launch off a ski jump and land in a pool of water. Nick & Matt are right behind them, but Gino & Jesse complete the Road Block and can now head to the Finish Line: the 12th hole of the Nicklaus North Golf Course. Gino & Jesse officially cross the Finish Line first and win all the prizes. 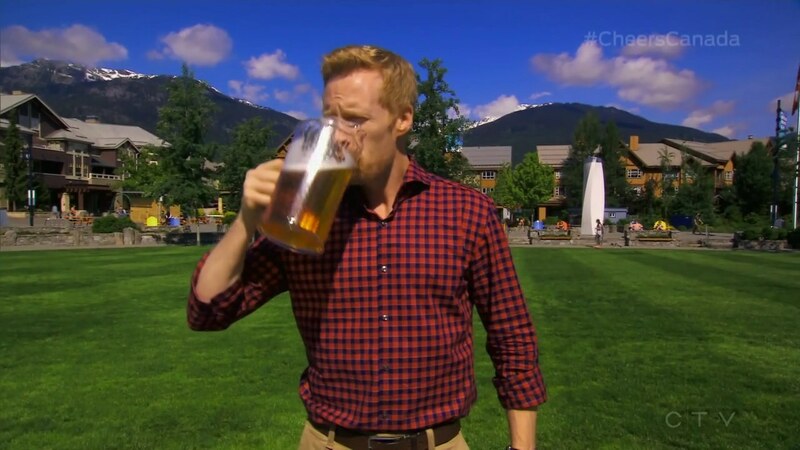 They tell Jon you don’t need to travel anywhere else for season 4 of TAR Canada because Canada already has everything. Nick & Matt are 2nd. And Brent & Sean are 3rd. Sean starts heaving, but he doesn’t throw up. Well, that was really underwhelming. Now, I wasn’t even really that excited going into this episode to begin with. But the Leg itself was not Final Leg worthy. It was an early “weed out the fillers” kind of Leg at best. Seriously though, a first-come, first-served task in the Final Leg?! Come on now. While it didn’t really matter because the first two teams did it one go, it could’ve easily gone the other way. You’ve got to have tasks in which teams are competing side-by-side, not getting in a line that determines the rest of the Leg. The map task was maybe the best, relatively speaking, task of the Leg. But it also would’ve been much better if they didn’t have that Air Canada task earlier in the Race which is basically the same type of task. The champagne and the skis were pretty bland. But that’s what happens when you have a Leg in Whistler which is compact and much more conducive for an early Leg with lots of teams. Overall, a very bland Final Leg. But then, it’s very fitting after last week’s debacle. I’m not sure where to place this season with respect to the first two. I think overall, season 1 might still be the best season. Season 2 was fine, but was marred by really ugly (and inexplicable) bitterness at the reunions. What works in season 3’s favor is the perceived parity amongst the teams in the first 2/3 of the Race. Different winners each Leg, teams shuffling placements throughout Legs. That’s pretty good and made for good competition even when tasks were not up to par. But that’s also a problem. The poor tasks are a result of TAR Canada running out of and exhausting Canadian locations. The tasks for half of the Canadian Legs were generic, first world tasks. Some even recycled from the first two seasons. Season 4 will need to have most of its Legs, if not ALL of its Legs, outside of Canada. I think the Canadian self-promotion has been taken to its limit. And so, leave the Canadian Legs to other TARs instead. They need to be careful and not seem to be incredibly xenophobic. There’s a difference between national pride and xenophobia. The lack of U-Turn limits has also been interesting. And they either need to majorly fix or simply dump the Face Off which has taken TAR Israel’s fun Double Battle and made it even worse than TAR Philippines did last year. With regards to both, TAR Canada also needs to make its rules more clear to prevent any questions. So overall, I think season 3 is the weakest season so far, but with some great teams that definitely deserve a shot when or if All-Stars happens. Simi & Ope were awesome. First Leg, they already showed they had a good fighting spirit. Their lone misstep in quitting the Face Off has as much to do with the poorly planned task and not wanting to literally freeze themselves sick (like Kristin actually did in the Road Block). But they otherwise kept fighting, were positive, encouraged each other and displayed all the best qualities of any parent-child team. Neil & Kristin were also great. Kristin especially was lots of fun. Definitely did not like Neil’s quitting on their final Leg which was such a contrast to them fighting through the pain during the Magdalen Islands Leg. Still, overall, they were a great team to root for, especially after slow first few Legs. Brian & Cynthia were definitely TAR Canada’s Teri & Ian-lite. They were consistent Racers and were hilarious much of the time. Brian was #NotImpressed, but I certainly was by them. Brent & Sean were just okay overall. But I have to put them this high only for their epic Pit Stop moments which of course involved Sean’s vomiting. Plus that moment in India during the yoga Detour alone is worth pushing them up the list a few spots. That final gag and heave at the Finish Line felt very forced though. Susan & Sharnjit definitely surprised me. I expected a TARPH #AlabangHousewives-type of team, but they actually seemed like they could’ve handled a lot more. They were basically eliminated by a selfie task, but they otherwise did well with everything else. Definitely eliminated too early. Max & Elias also seemed like a team with potential. It’s too bad their only Leg worked out the way it did. Dana & Amanda kinda disappointed me because I expected a lot more from a team of cops. Nic & Sabrina had lots of hilarious exchanges, but their Racing was absolutely horrible and they were eliminated at the right time. Hamilton & Michaela were pretty bland, even for a couple team. They get kudos for finishing the Leg even while worrying about their passport. But they really were flat most of the time. Dujean & Leilani were all over the place. Some Legs they were awesome Racers, others they were a hilarious bickering “couple.” But their last Leg was an absolute mess. A horrible way to get eliminated and it definitely was not a good representation of their Race which was overall consistent. Gino & Jesse were an enigma. Most of the Race, I was just meh to them. They didn’t do the bickering siblings act (which is when they were most enjoyable) enough. In the beginning of the Race, they were bumbling their way through which was a little fun. But that quickly changed. And the rest of the time, they were the typical alpha male team. Then came the hypocrisy in India and their taxi stealing in the penultimate Leg. I don’t really care one way or the other that they won. But they really destroyed any positive feelings I had for them after last week. Nick & Matt were maybe the most consistent team this season. Consistent, yet boring. And then everything came crashing down with their horrible behavior in the penultimate Leg. Stealing cabs, intimidating a father and daughter team and being hypocrites certainly won’t earn you any kudos. Some of the worst behavior on any TAR I’ve ever seen.